The baying for his scalp has gone up a few decibels. 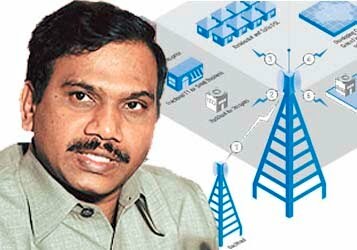 Just how much does Union Telecom Minister Andimuthu Raja have to hide? He is being called the architect of the biggest scam that Free India has ever seen. And his party, the DMK, is being called a family business, with him as cash collector-in-chief stationed in Delhi, where money can be made from thin air, literally—so long as telecom firms remain starved of this state-controlled resource, the very scarcity of which ensures the endurance of that relic called the Licence Raj in this business sector. Telecom licences and chunks of airwave spectrum ought to be auctioned, as anything scarce with multiple buyers vying for it should be. In 2008, what Raja conveniently did instead was give the stuff away to a motley bunch on a first-come-first-serve basis—a practice without precedent—for a song. This, despite objections of the Telecom Regulatory Authority of India (Trai), and in total disregard for orders from the Prime Minister to use a fair and transparent method for awarding second generation (2G) spectrum to cellphone service firms. The estimated loss to the exchequer is in the Rs 20,000–60,000 crore range. The investigating agencies are not ready to give Raja a clean chit yet, even as industrial groups which missed his generosity lobby hard for his dismissal from the Union Cabinet. For the DMK, which won back its lost popular mandate in Tamil Nadu by levying heavy-duty corruption charges against former Chief Minister Jayalalithaa, the mess looks especially bad because nobody believes Raja would have dared act solely on his own behalf. “Raja is one of the very few top-ranking DMK leaders who come from outside the Karunanidhi family,” says Cho Ramaswamy, a political observer, “He doesn’t have the guts to do anything without the knowledge of his party and its leadership.” That the party’s octogenarian supremo and current CM, M Karunanidhi, has bent backwards to defend Raja only arouses extra curiosity. For Jayalalithhaa’s All India Anna Dravida Munnetra Kazagham (AIADMK), this is a touché moment. She has dubbed him the most corrupt Tamil politician of all, and her party has wallpapered his hometown Perambalur with posters belittling him as ‘Spectrum Raja’ and ‘Kickback Raja’. But Raja is not a worried man. A lawyer by training, he simply repeats his single line defence—that he did nothing illegal. And with Karunanidhi’s backing (who claims he’s being picked on for being Dalit), ousting Raja from his ministry could mean losing the DMK from the United Progressive Alliance (UPA) at a time the ruling coalition’s Parliamentary majority has already been whittled down. What’s less clear is how exactly the telecom minister fits into the DMK matrix. Asks Ramaswamy, “Why is the CM solidly behind him when Raja has no clout with Stalin and Alagiri?” Some observers believe the party’s coddling of Raja can be traced to Karunanidhi’s younger daughter Kanimozhi, a Rajya Sabha member who had, along with her mother Rajathi Ammal, handled the shift of the telecom portfolio (under UPA I) to Raja from Dayanidhi Maran after the latter fell out with the supremo. It was a family feud which has been resolved since. Here, a look at Karunanidhi’s family tree is instructive. He married twice after the death of his first wife. Stalin and Alagiri are among the four children from his second wife Dayalu, while Kanimozhi is the only daughter of Rajathi. What Kanimozhi shares with Raja is a special camaraderie of letters, both being self-styled Tamil litterateurs. Raja’s detractors say Kanimozhi’s keenness to have Raja retained as telecom minister under UPA II has been exposed by phone conversations—eavesdropped upon by sleuths—that feature the alleged voice of PR honcho Niira Radia. “Raja is powerful because he enjoys the confidence of Rajathi Ammal and Kanimozhi. The recently released documents hint at their role in the kickbacks too. They show Radia had good relations with Ratnam, Rajathi’s chartered accountant who was involved in the DMK patriarch’s two family members’ investment in Swan Telecom, one of the establishments figuring in the spectrum controversy,” alleges AIADMK parliamentarian M Thambidurai. From this angle, Karunanidhi’s affection for Kanimozhi is Raja’s best shield. A Dalit leader who represents the Nilgiri constituency, he is not new to controversy. Not too long ago, Justice R Raghupathy of the Madras High Court revealed that a Union minister had threatened him to grant bail to the accused in an education scam. Raja had earlier stirred things up when he turned down CBI requests to prosecute some MTNL officials. Then, there was the matter of Raja’s role in awarding Chinese firms some telecom contracts despite misgivings from India’s security establishment. Raja’s political career, however, seems unaffected. At 47, he is already a four-term MP. With a professed ideological leaning towards Periyar, Raja became a Dravida activist at age 11, joined the DMK in the late 1980s and was helped along by Dayanidhi’s father, the late DMK leader Murasoli Maran. Under the NDA, of which the DMK was a part, Raja had stints in the rural development and health ministries. Senior Maran’s death in November 2003 made him the DMK’s pointsman in Delhi. “Raja is known for his exemplary skills in public relations,” says C Lakshmanan, associate professor at Madras Institute of Development Studies, “It may have helped him stay afloat all these years, but there are indications that he has difficult days ahead.” The day the Congress decides it doesn’t need the DMK, the air around him might thin faster than the telecom plot thickens.